Menu Monotony: Advice Needed for a Mrs. Out of Ideas | mrs. and the misc. I have a case of the Mondays. Not in the traditional sense, but in the sense that my cooking repertoire is tired, boring, over-used, mundane … I’ve hit a wall with my home-cooking menu and I need your recipes and advice. Each month, to save money on groceries, I make a monthly menu. 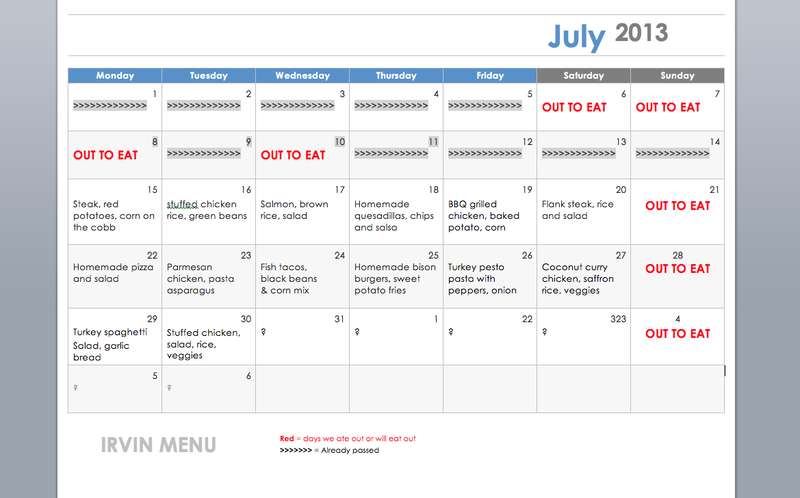 I outline an estimate of how many dinners and lunches we’ll eat at home for the month. This month, as I stared back at my Word calendar template trying to fill the squares with exciting cuisine that I’d actually look forward to making each night, I sat stumped. My go-to meals sounded blah in my brain; my newer recipes are already getting used too often and too close together; my quick scan of Pinterest for inspiration intimidates me with complicated recipes I can’t fathom attempting after an 8 hour work day (plus an hour–long Body Pump gym class – plus a post-workouut shower). You see, I want/need EASY. QUICK. AS FEW INGREDIENTS AS POSSIBLE. But…. I don’t like packaged foods (sorry no Hamburger Helper) nor preservative-filled quickies (Stoffer’s Lasagna is out). So how do I cook super quick, healthy and delicious foods and how am I supposed to keep mine and my husband’s palate’s happy when I keep cooking the same old stuff!?!?! What is your source for new (easy & healthy) recipes? What are some you’ve created on your own that you are willing to share? What’s your advice for rotating a menu? What’s the best rotation of meats each week (like how many days to do chicken or fish or beef, etc.)? Inspire me! Send me links! Help me refresh my recipe repertoire! What about breakfast for dinner? There are so many recipes that use hamburger or chicken, the list is limitless. Chicken pizza, taco pizza, taco salad, chicken salad, meatloaf, chili, different stews and soups, chicken and noodles, sloppy joes(use ketsup and mustard in place of canned sauce), chicken fried steak. I’ve heard some cooks have a no meat night or a leftovers night. Taco pizza and taco salad would be new ones for us! I did see a cute recipe for mini meatloaf made in a muffin tin on pinterest – that wouldn’t be too hard I bet! Yay, I really need to bust out my slow cooker more often! Try emeals.com….I heard about it from a friend at market. You can specify type of meal plan and how many people in family. You then pay small monthly fee, and it generates the recipes and the grocery list. It apparently saves a lot of money as well as trips to grocery store. We haven’t tried it yet, but might once we move! Ya, I’ve heard about it too. I forget who was telling me about it and it sounds cool. I just don’t know how religious I’d be in terms of following it. I face the same issue every night! After 2 hours of commuting, 8 hours of work, an hour of working out, showering, and doing grad school work – most nights I wish I could just skip dinner instead of trying to cook it! The place I find my healthy new recipes is Pinterest, SkinnyTaste.com and Cooking Light’s website and email. For the summertime, I’ve been getting big into stirfry’s and non-traditional salads because they are so quick. For stirfry’s, I’ll throw in any veggies I have or my farm fresh veggies I pick on the weekends, add some seasoning, maybe a little olive oil or coconut oil, a protein (if wanted), and done! For non-traditional salads I’ve been making a mess of veggies with chicken and hummus. Or chickpeas, cilantro, parsley, fat free feta cheese, lemon juice, etc. Stir Fry sounds good! What’s your go-to stir fry recipe?! Yum! You’re making me hungry! Thanks!!! Pingback: Finally, a New Recipe to Keep Cooking: Ranch Chicken (Seriously Easy, Seriously Delicious) | mrs. & the misc.